The other night I brought dinner to a friend’s house just because it seemed liked a fun way to spend the night. My friend has two small children, so whatever I made needed to be kid-friendly. 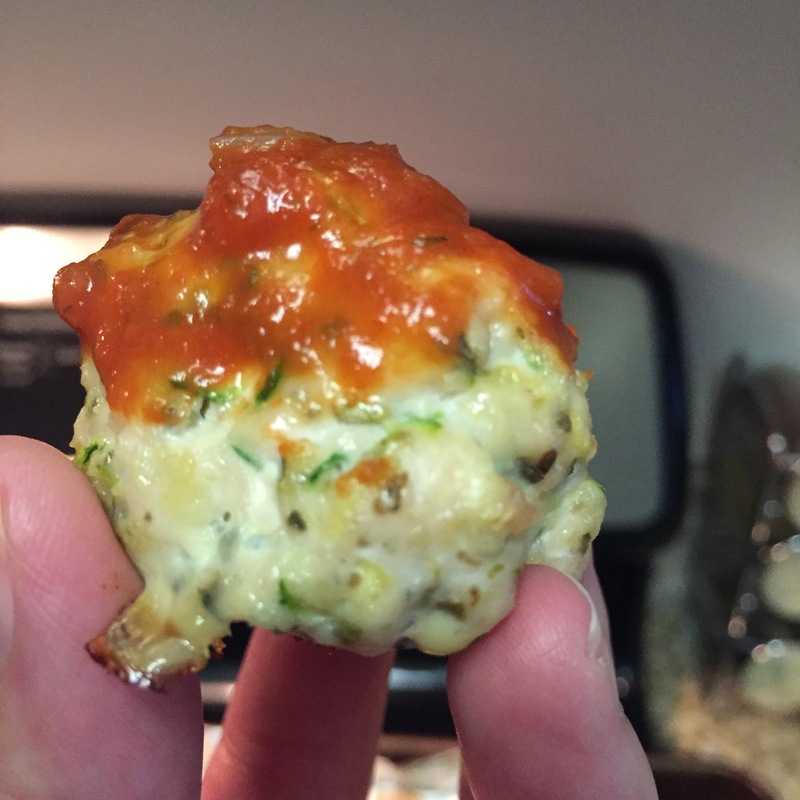 These turkey-zucchini meatballs were the right choice, and a great way to sneak veggies into a family meal. Preheat your oven to 350 degrees. Line a baking sheet with aluminum foil. In a medium mixing bowl, combine the zucchini with the eggs and spices. Mix in the bread crumbs and the turkey. Form the mixture into meatballs (about 1-2 inches in diameter; should make roughly 18 meatballs) and place on the prepared baking sheet. Bake 15-18 minutes until cooked through. D and I stumbled upon a big sale on pork tenderloin the other Sunday. Lucky us! We decided to marinade the pork in a sweet and spicy sauce and then grill it for some extra deliciousness. We only marinated it for a few hours, but it would be even more succulent if you could marinate it for a day or two before cooking. It was so yummy that we forgot to take a picture! In a large ziplock bag, combine everything but the pork. Seal and shake to mix. Add the pork to the marinade and toss to coat. Remove excess air from the bag, seal and refrigerate. Allow to marinate for at least 4 hours. Heat your grill to high heat. Cook to your preference. We like 7 minutes on one side and 6 minutes on the other with the lid closed. Because we have a gas grill, then we turn it off and leave the pork in for another 5 minutes. I LOVE CHICKEN TENDERS. I admit it. They are one of my favorite meals and can always turn my day around for the better. These are quick to put together and then are baked. The end result is a crispy meal that will make you smile. In a large ziplock bag, combine the buttermilk with the hot sauce. Add the chicken into the marinade. Allow to marinate for at least an hour. On a large plate, combine the flour with the paprika, garlic powder, and 1/4 teaspoon of the pepper. On a large plate, beat the eggs until the whites and yolks are combined. 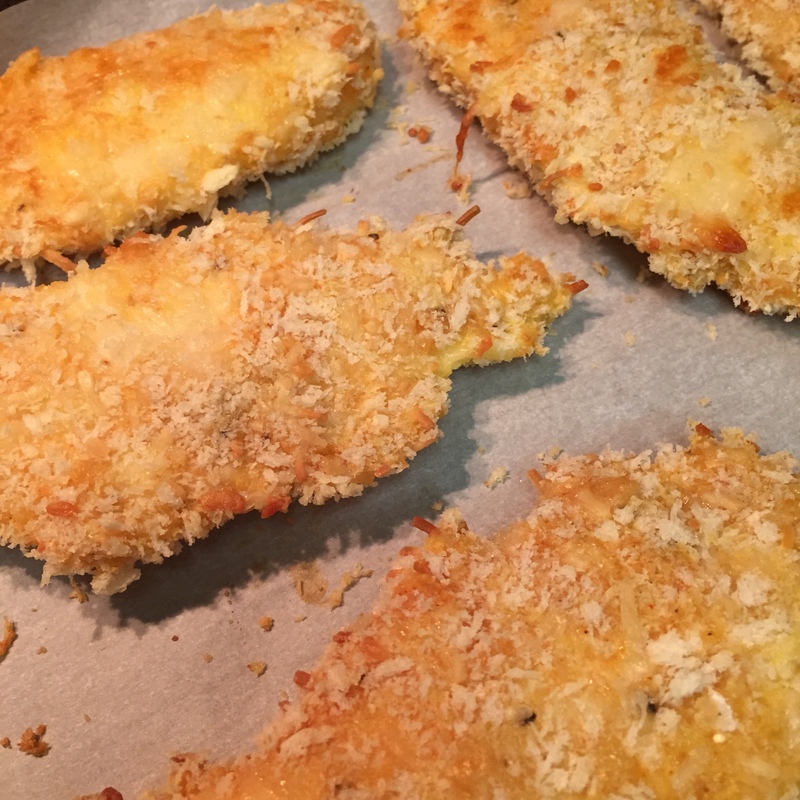 On a third plate, combine the bread crumbs with the remaining 1/2 teaspoon of pepper, the salt and the Parmesan. For each piece of chicken, allow the excess buttermilk to shake off. Then dredge in the flour mixture. Coat with egg and then dredge in the Parmesan mixture. Place the chicken on the prepared baking sheet. Flip the chicken over and bake for another 10 minutes, or until cooked through and golden. Did you like the other popsicles? Here is the second summer treat we made for the party. It also makes about 6 popsicles. In a small sauce pot, combine the sugar and water. Over medium-low heat, stir until dissolved and bring to a boil. Allow the syrup to boil for 5 minutes. In a medium mixing bowl, combine one cup of the syrup with the grapefruit juice and Campari. 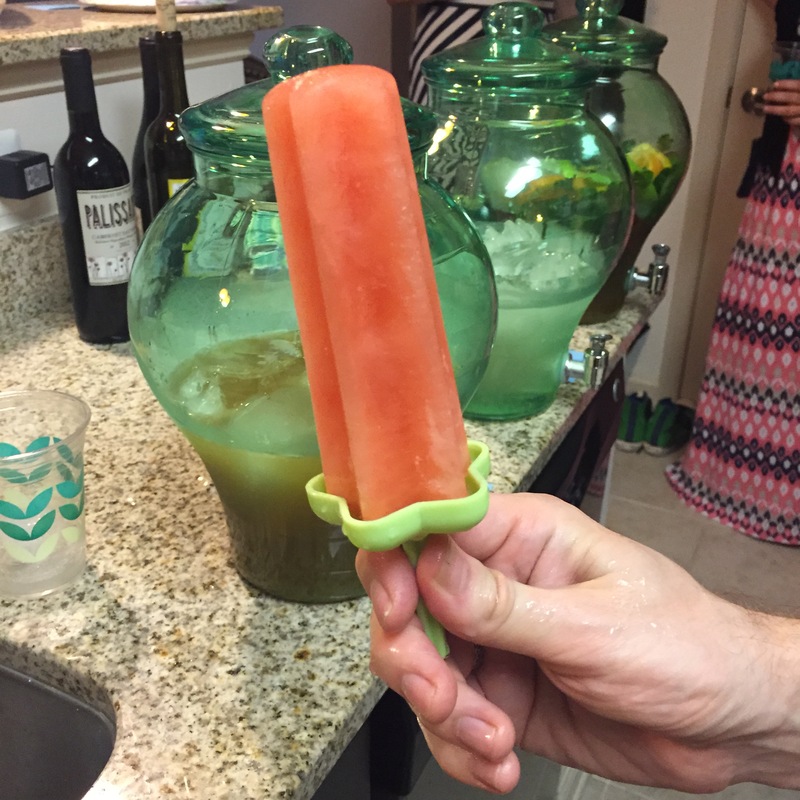 Pour into popsicle molds and allow to freeze overnight. Find some friends on a warm summer night and enjoy together! Popsicles are one of the best summer treats. If you decide to make them at home, you can pick your favorite flavors AND your favorite shapes. A few summers ago, I found some fun sailboat and star molds online. 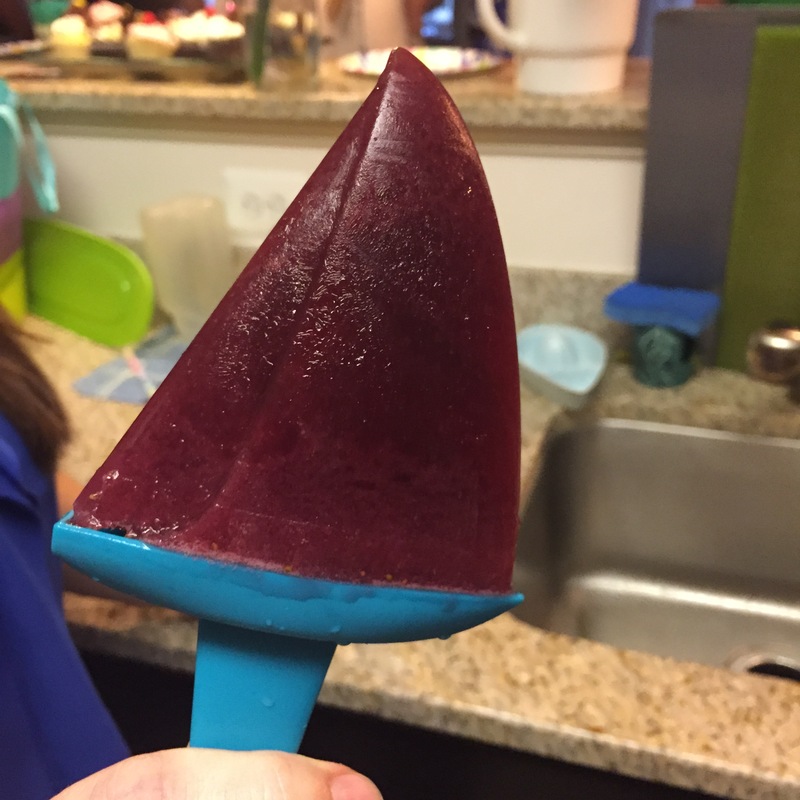 We used them to make frozen treats for a recent party. Here is one of the recipes; it makes about 6 popsicles. In a large mixing bowl, combine all the ingredients together. Enjoy on a hot summer day with friends. You are currently browsing the Muffin Bites blog archives for July, 2015.